November is the month when sheep usually come into our valley for winter grazing. In the old days, it was a rush to bring sheep from more populated areas along the Wasatch Front in Utah out to our isolated valley. There would be one or two sheepherders for each 2,000 sheep. A sheepherder would live out of his wagon, going to a rural store every few weeks to get supplies. Otherwise, it was him, the sheep, his horse, and his dogs. A pretty solitary life. Today it's still a fairly solitary life for sheepherders. Not many people want to do it, and sheep operators often have to recruit men from other countries to be sheep herders. We see quite a few Peruvians come to this area, spending a year or two watching sheep before they go back to see their families. 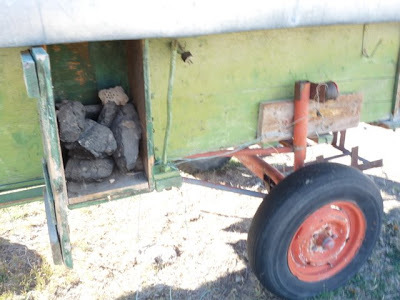 Our ranch doesn't raise sheep anymore and hasn't for quite awhile, but we still have this old sheep wagon. The other day I decided to take a peek at it to try to get some insight into what it was like being a sheep herder. The interior is sort of like an ultra-mini-RV. There's a bed, folding tables, and built in seats with storage space underneath. One big difference from today's RVs is the presence of this coal/wood burning stove. Because sheep herders are out in these wagons on the desert valleys in the winter, it can get really cold. Sometimes they even get trapped by blizzards for days at a time. 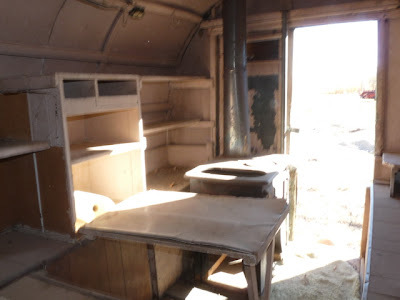 Here's a wider view of the "kitchen/living area" of the sheep wagon. A sheep herder really doesn't have room for a lot of extra stuff. 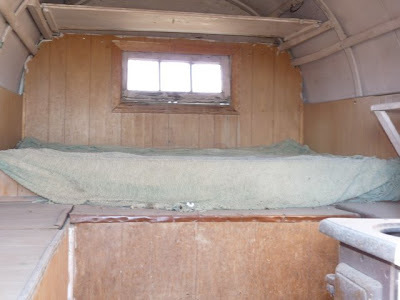 There are some compartments on the outside of the sheep wagon, like this one for coal. There's a big one under the bed for spare tires, fuel, and other equipment. Often a separate wagon is left next to the sheep wagon carrying hay for the horse. The wagons are simply built. A back window is a bit of a luxury. There are no shocks on the chassis, so everything has to be well secured before moving the wagon to a new location. Nowadays, the wagon is moved every week or two as the sheep continue moving to graze available forage. The wagon above is obviously old, and you're probably wondering if sheep herders still live so primitively. The answer is no. 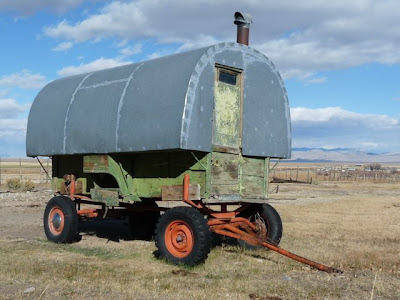 This is a newer sheep wagon. 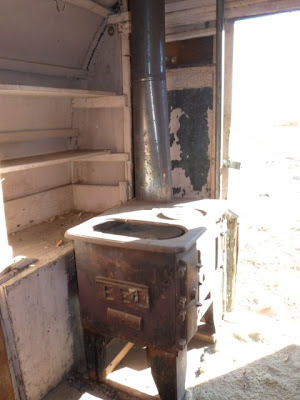 It still has small windows, a small shape, lots of storage compartments, and a wood burning stove. But it also has solar panels. Wow - I had no idea!! 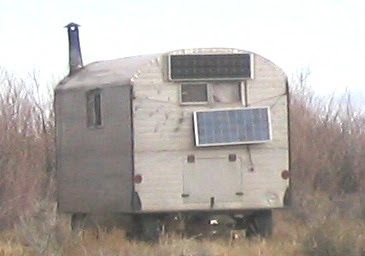 Ah, the first luxury rv. Can't you just imagine a campground full of these? The ranch only has one of them? Are you sure there are not three of four of them out in the "equipment" yard? What does the modern sheep herder do with the electricity from the solar cells? Is if for radio, or television, or internet access, or a phone? How about a microwave? To recharge batteries? What does he do with this very limited amount of power? By the way, this might make an interesting display at your local visitor's center. It reminds me of a caboose that is on display at a nearby railroad museum. The ranch has one other sheep camp in decent condition, but there are probably parts scattered here and there, including the equipment yard. Electricity is primarily used for lights during the long winter evenings so the sheep herder can read, cook, write cowboy poetry, or play cards. Electricity might also be used for a radio, electric shaver, or other amenities. When they can, sheep herders park the sheep wagon near a creek in order to have some close-by running water. That is a cool sheep camp. If you want to see some new ones you can go to wilsonsheepcamps.com. they build new sheep camps and have everything in them. they really beat rv's now days! There are plenty of companies around the states that restore sheepcamps like the ones you have pictured here. You could make quite a lot of money having it restored and then selling it!! 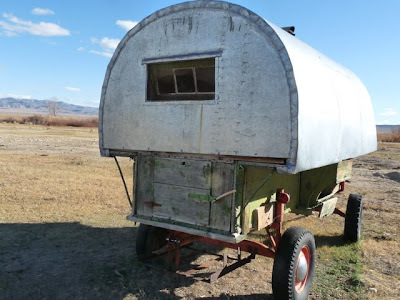 Just do a search online for sheep camp or sheep wagon for sale. Restored and brand new ones fully outfitted sell for up to 35,000. Don't let that wagon sit out there and rot away!!!! I'm so envy seeing these images because I want to live in a place like that, because I'm bored to live in the city where life is faster and stressful.